My wife, Yara and I were recently invited to a birthday party for our neighbor’s 2-year-old son, Javier. 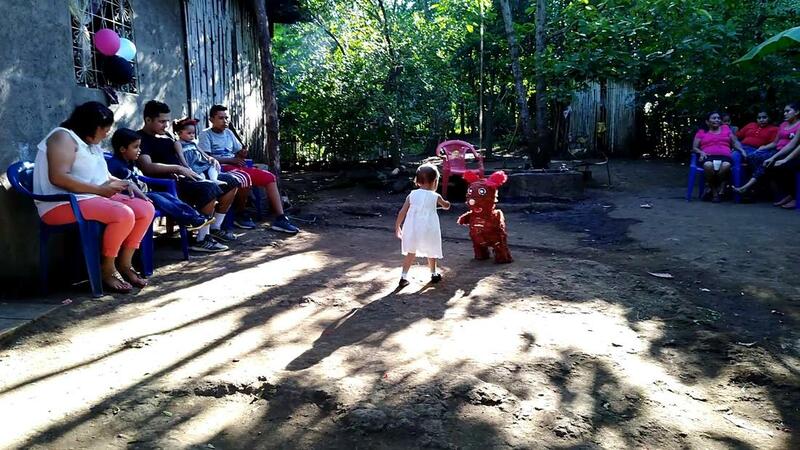 Rosa and Carlos are a young couple who have just built a small, two room, cement block house on Rosa’s parents’ land. The house still needs doors and windows, so they haven’t been able to move in yet. They are not sure when they will be able to get the 2 doors and 2 windows made, so for the time being, they are living at Rosa’s parents’ house (a small, 3 room house for 9 people). They were, however, able to have Javier’s birthday party at their new house. It was a small party with a few neighbors, friends and family members. They served a small plate of rice, vegetables and grilled chicken and there was of course a piñata and a birthday cake. You could just see the joy and pride on both Rosa and Carlos’ faces as they received their guests in their new, humble home. Carlos spent most of the time taking photos with his phone, he didn’t want to miss any of it! Rosa’s father, Chico led the piñata and was just filled with joy as he tried to pull the piñata rope and make the children miss! Javier received a few presents from the guests that came. He received a pair of socks, some baby lotion, and little plastic ball. He loved ripping off the wrapping paper and he enjoyed playing with the plastic ball. However, he spent most of the time pulling what was left of the piñata along the ground while other children tried to grab it! Rosa is a nurse and works at the local health center, where healthcare is free for all. Carlos is a police officer who is a member of a team that works with at risk youth. They are both young professionals who are serving their communities. Rosa benefited from a government scholarship program in order to study nursing and Carlos was able to receive communications and computer training through the National Police. He was also able to receive a loan in order to buy materials for the construction of the house. The family has also benefited from Compas programs. Rosa’s father, Chico has received microloans in order to prepare his fields for planting. He has also benefited from the reforestation project with donations of coffee, cocoa, moringa and shade trees. The sale of coffee, cocoa and moringa has helped the family through the worst part of the political unrest in June and July. Rosa and Carlos are thankful for the opportunities the government has provided them and also the support the family has received from Compas. They are not only thankful for the many blessings in their life, but, like most Nicaraguans, they also give back. Beyond their own jobs serving the community, they also volunteer to help others whenever they can. Rosa volunteers for an environmental group that Compas has worked with on reforestation projects. She also volunteers during the community vaccination campaigns. Carlos volunteers helping with natural disasters and recently helped rescue families stranded by flooding from the heavy, October rains. He also helped bring food and basic supplies that were donated by the government for families affected by flooding. The birthday party ended with everyone standing together and signing happy birthday to Javier with his birthday cake! He ate the icing first, then the cake! Only a week earlier we had celebrated our own daughter, Harolee’s birthday. We had asked Harolee if she wanted presents or a piñata birthday party. She said, “no presents, I want lots of kids!” I had hoped to be able to celebrate her birthday with a party and also buy her a few presents and toys, but we couldn’t afford it. We haven’t bought her a new toy this whole year and I had been feeling badly about it. I told Harolee that if we have a party that we wouldn’t be able to buy her any toys. She said, “papa, I got toys here!”, pointing to a plastic bag where she keeps her toys. 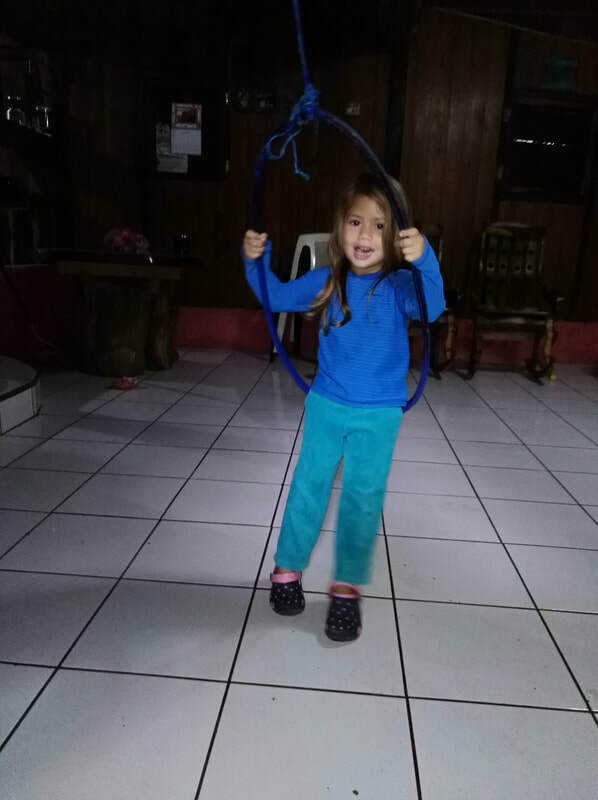 It turns out Harolee is very much Nicaraguan, as she felt it was much more important to have “lots of kids” celebrate a piñata with her than to receive presents and toys. But then again, her favorite toy recently has been the top ring of a plastic barrel which she uses to roll on the ground, as a hula hoop, and as a swing. I am thankful to live in a place where people are genuinely thankful for their blessings, eager to help others in need, and prefer to share their blessings with others. I am always being taught important lessons here in Nicaragua about being thankful, and about how we are most happy when doing for others. And, I am thankful that my daughter is already learning this lesson.